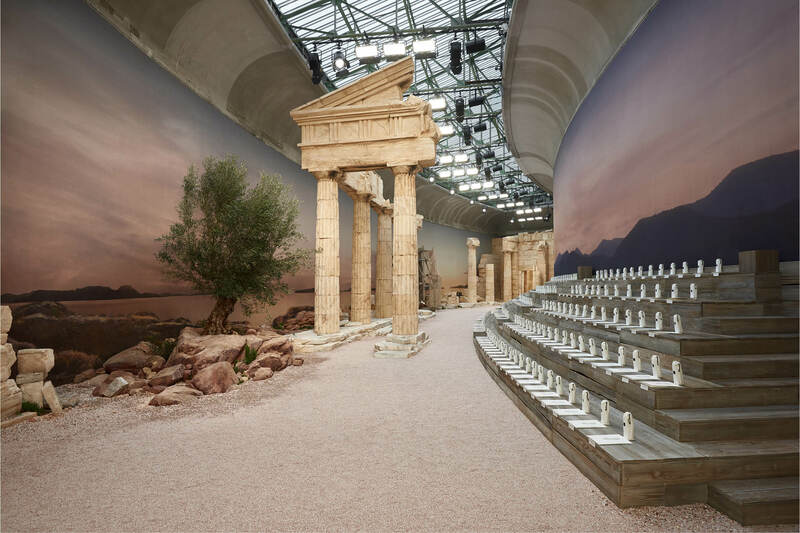 Living up to its reputation of sets that are always surreal and extravagant, Chanel transformed the Grand Palais into an ancient Greek temple for its Cruise 2018 show. Models who looked no less than Greek goddesses sashayed down the ramp in silhouettes that were both fluid and structured. The latest collection to hit the ramps and cascade down our Instagram feeds drew inspiration from Greek antiquity – ‘the cradle of culture, beauty, and modernity’, and re-imagines the Camelot of Grecian fashion. Supple drapes and elegant lines in tweed and jersey, silk and linen, lace and crepe got us lusting for an exotic summer getaway. Raw fringes on skirt suits mingled with precious embroidery while column-heel gladiators (an ultra-modern spin on the traditional Greek sandal) made a striking impression. Accessories such as sautoirs, bracelets, and golden cuffs lent a delicate grandeur to the je ne saas quoi vibe of the collection. Also on display were the minaudières and clutches crafted in draped leather or bronzed skins. ‘Reality is of no interest to me. I use what I like. My Greece is an idea,’ says Lagerfeld about presenting an idealised vision of Greece. The palette was a mix of dazzling whites, blacks and blues. Draped and gathered shoulders, structured lines, and belted waists lent a mystical appeal. Buttons were engraved with owls (mythological symbols of wisdom), and other prints such as laurel crowns, oak leaves with hidden camellias drew our attention to the smallest, most intricate motifs. Draped jersey tops, long skirts, wide, fluid sun-pleated trousers and jumpsuits in black, white and beige or terracotta and gold added variation to the line. Fringed and unlined pale and ochre tweed applied to crossover coats and zipped shepherdess dresses are just as feminine and flattering as they are comfortable, luxurious and wearable, all at once. Controlled contrasts could be seen in linen dresses that were peppered with embroideries of multi-colored stones. Mousseline dresses were worn under long tunics printed with crowns of golden leaves. And as if this wasn’t enough to get us all dreamy-eyed, dresses embroidered with spirals (a symbol of movement, life, and energy) lent balance to Spartan-inspired tops and skirts. An Elysian bliss, no less.